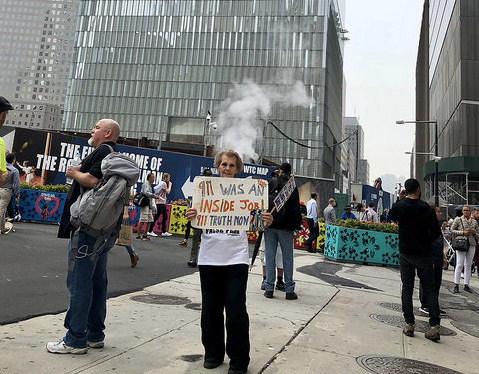 ‘I think it’s a very important time to come over here,” said the 85-year-old Wilhide, a resident of Morristown, New Jersey. 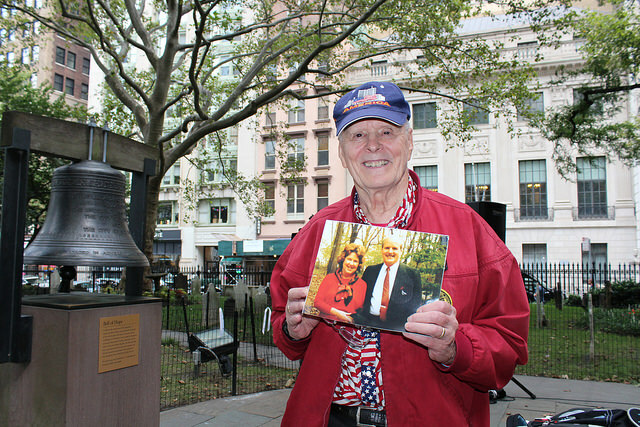 Wilhide was among roughly 100 people present on the anniversary of 9/11 for the Ringing the Bell ceremony at the chapel, which stands adjacent to the site of the World Trade Center and became a source of refuge and place for reflection for many first-responders in the months following the attack. 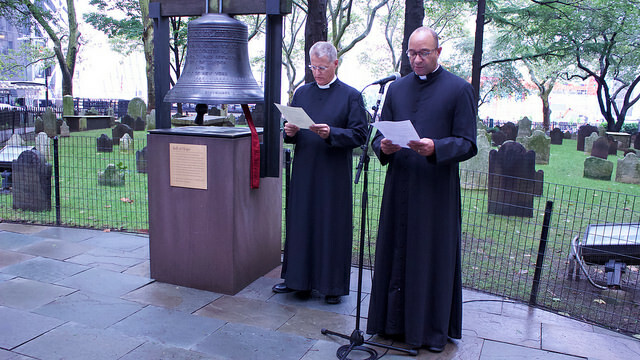 On the first anniversary of 9/11, the Mayor of London and the Archbishop of Canterbury presented the Bell of Hope to St. Paul’s Chapel, which has been operating in Manhattan since colonial times. “This is a holy, sacred day for people all around the world,” the Rev. William Lupfer said, welcoming visitors to the chapel’s courtyard. The bell, roughly two-feet tall and hoisted above a base made of brownstone, was cast in London’s Whitechapel Bell Foundry, where Philadelphia’s Liberty Bell was made. 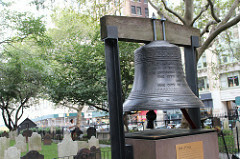 The bell, which is rung on the anniversary of 9/11 each year, was also rung after terrorist attacks in London, Madrid and Mumbai, as well as after mass shootings in Aurora, Colorado and at Virginia Tech. Wilhide said he woke up Sunday at 4 a.m. so he could make the journey from New Jersey to Lower Manhattan. While working in the old AT&T building during the late ‘60s and ‘70s, Wilhide was able to see the World Trade Center as it was built. “So when I would go home to New Jersey, I’d go through the towers to get the subway to go home,” he said. Thomas Pearce, 22, visited the chapel to pay his respects to those who died in the attacks. .Pearce, who has lived in Flatbush, Brooklyn for the past four months, recalled his experience on 9/11 as a 7-year-old in the United Kingdom. Elena Shnayer, 25, said she came to St. Paul’s Chapel early Sunday morning to show her remembrance and appreciation for those who have passed away. Growing up in New York City, Schnayer vividly remembers the day the towers fell. “I was 11 – it was my fourth day of fifth grade,” said Schnayer, who lives in Flatbush. “I went to school in Lower Manhattan. Our parents picked us up and I went outside, and I could see everything. “I was able to see smoke, I was able to see people jumping and falling – everything,” she said. Schnayer said this year was the first time, with Pearce, her friend and roommate, by her side, that she was able to bring herself to attend the Ringing of the Bell ceremony. 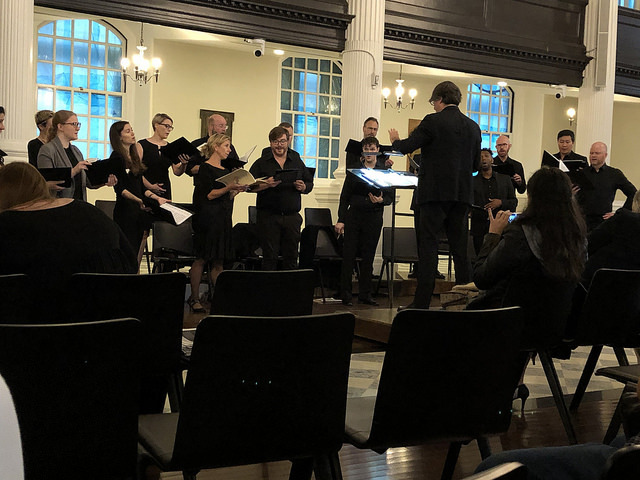 At 8:46 a.m., the moment American Airlines Flight 11 crashed into the North Tower, Lupfer rang the bell in four sets of five rings, following the tradition of the New York City firefighters salute to fallen comrades.